This section explains how your retirement benefit is calculated if you decide to retire at age 65—the Plan’s normal retirement age—or later. If you retire later than age 65, your benefit is higher. Once you are vested and reach normal retirement age (usually age 65), you can choose to begin receiving your benefits at any time up to age 70. You are not required to retire from employment; you can still work for the same employer or any other employer. It does not matter how many hours you work. If you join the Plan within two years of your 65th birthday, your normal retirement age is the second anniversary of your first covered hour. Note: If you are not vested when you reach your normal retirement age, you cannot retire until the month after you become vested. Click here to see the Special Vesting Rule — Ages 65 and Over. Your collective bargaining agreement may control whether you can still continue your covered work after you start receiving your retirement benefits. Many contracts have rules that concern loss of seniority or other rights at retirement. Be sure to find out about these rules beforehand from your local union or employer if you are age 65 or over and intend to continue working for the same employer after your pension starts. If you choose to begin receiving your benefits at age 65, you will receive 100% of your normal retirement benefit. If you decide to start receiving your benefits later, your normal retirement benefit is increased for each month after age 65 that you delay your retirement up to age 70. This is called your late retirement factor. Click here to see a list of late retirement factors. 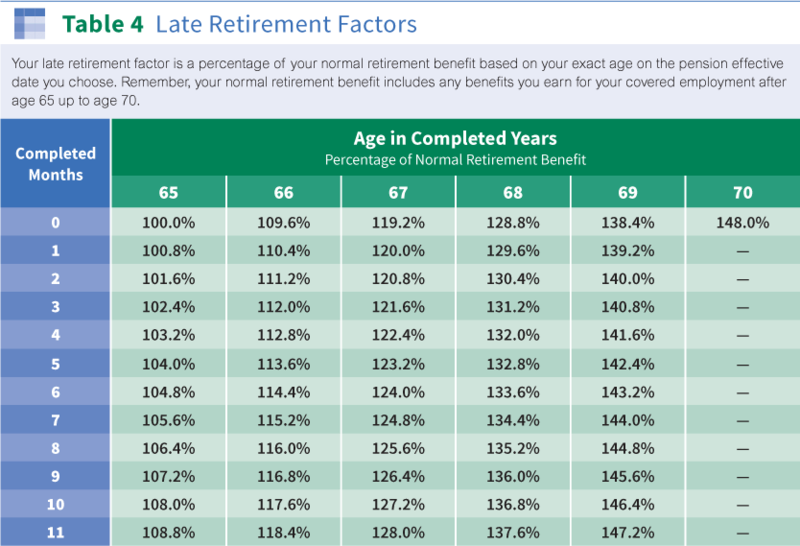 The chart below shows how your normal retirement benefit is determined. If you are still working in covered employment on your pension effective date, your retirement benefit is calculated using only the covered hours and basic employer contributions you earn up to your elected pension effective date. However, you may qualify for a pension increase based on your covered employment after your pension effective date. See Increasing Your Benefit After Retirement for details. The calculation of your retirement benefit amount always starts with your normal retirement benefit. The monthly benefit you actually receive can be adjusted up or down depending on your age at retirement as explained in this section, Early Retirement and Disability Retirement. It is adjusted further if you choose a form of pension payment other than the life only pension (see Applying for Retirement Benefits). Once you reach your normal retirement age, you can choose to have your retirement benefit start on the first of any month between ages 65 and 70, even if you are still working. You must apply for benefits with your Plan’s Administrative Office and the Plan’s retro payment rule will apply. Click here for information on how to apply for benefits and how to choose your pension effective date. If you wait to retire after age 65, your normal retirement benefit is based on all your covered hours up to your pension effective date and is multiplied by a late retirement factor. Each month you wait increases your late retirement factor. Click here to see how your late retirement factor increases—up to the Plan maximum of 148% if your pension begins at age 70. Click here for an example of calculating your late retirement benefit (after age 65). Once you reach age 70, you must start drawing your retirement benefits, even if you keep working in covered employment past age 70. 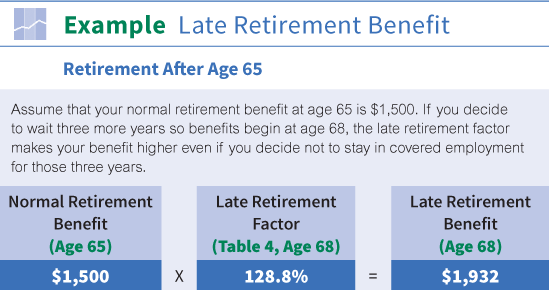 Your benefit amount is calculated in the same way as if you chose to retire at age 70 (as explained above in this section). Your pension effective date will be the first of the month following your 70th birthday. If your 70th birthday falls on the first of a month, your pension effective date will be the first day of that month. To avoid substantial tax penalties, you should file your application no later than your 70th birthday so your actual pension payments start before April 1 following the year when you turn age 70 1/2. If you miss this deadline and are no longer working, the Internal Revenue Service can impose substantial penalties on you. If you are near age 70 or already over age 70, and have not yet filed a retirement application, contact your Administrative Office immediately. To avoid or minimize any tax penalties, you need to file a completed retirement application with your Administrative Office so your benefit payments can begin as soon as possible. Click here for information on how to apply for benefits and how to choose your pension effective date. Note: If you have any questions about these or other tax issues affecting your benefits, contact your personal tax advisor or the Internal Revenue Service. Click here for questions and answers about Normal Retirement.